Scrabble Blast takes the popular word creation game and adds a few new twists for those who like to play word games on their computer, GameBoy Advance and mobile phone. Scrabble Blast was released in May of 2005 for various portable gaming systems like the GameBoy Advance. Soon after, the game became available for mobile phones. This game won Software Informer Editor's Pick award for best puzzle and word game. If you enjoy the physical board game Scrabble and want to take a portable version of the game with you, Scrabble Blast is your answer. Scrabble Blast isn't played the same way as the traditional version; it was created for fast-paced word creation action. The Official Scrabble Dictionary is included within the game so all the words have been checked and verified to be correct. 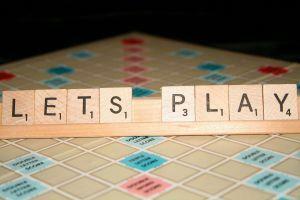 There are three game modes to get your Scrabble fix. In one of the game modes, you are given 100 Scrabble tiles and must create as many words as you can for the maximum amount of points. After exhausting what you think are all the words in the current game board, you can try again with the same letters and same configuration to see if you can beat your score. Another game mode includes Number Bombs. As you make words in lengths indicated on the bomb, they explode for extra points. The third game mode is for the quick word creator. The bombs fall, and you must create the words in lengths listed on the bomb. When you do, you get points for the word and points for the exploding bomb. Over the course of the game, the bombs fall faster and faster, making you create words faster and faster. For those who are competitive, you can either play against artificial intelligence in a game of Scrabble Blast or-if you play the game on the GameBoy Advance-with other human players if you physically use the GameBoy link. The main screen for the game lists the current player who is logged in to the game (or the last person to play). In the middle of the screen is a high score listing, which is dependent on the game that is selected on the right side of the screen. The game modes are called "1 Bag," "Puzzle," and "Action." Selecting a different game will change the high scores. Also, on the options screen is a "How to Play' button and "Quit" option. The middle of the main gameplay screen is where you'll be doing most of your action. The tiles are placed in a 7 by 7 square board. Double, triple red and triple blue squares are also included for bonus points. On the left side of the screen, you'll see the words you make as well as the points they are worth. The top right includes your score, and the bottom right has a "Hint" button and an "Exchange" button. The exchange button lets you switch a tile on your rack with one on the board. There is also a Scrabble tile guy on the screen reacting to your gameplay, whether it's good or bad. If you have a PC and would like to try out the game, then download a demo copy. Visit Wired Arcade to get your 60 minute trial version of the game. You can purchase the game directly from your demo copy, or if you know you want to buy it right away, you can do so from the website. The game runs $19.99. If you enjoy Scrabble but find it hard to bust out your board and tiles or have a hard time finding other players, then play the computer or handheld version to increase your skill or to play an arcade-like version of Scrabble.